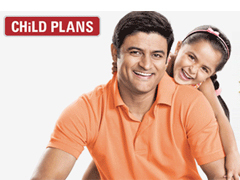 ICICI Pru Smart Kid Regular Premium plan is really smart? 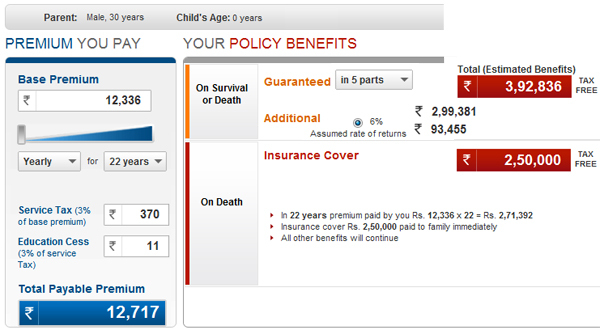 Home » Insurance » ICICI Pru Smart Kid Regular Premium plan is really smart? Cost of living is sky-rocketing today, with each passing year we are witnessing increase in the cost due to inflation and other factors. Not only cost of living cost of education is also increasing like anything. As a responsible parent we have very important role to be play for our child. We have to make sure that our child gets whatever he/she needs to develop his potential and be successful. To convert this dream in to reality we need adequate money and prior financial planning. We have to make sure that we will fulfill our child’s dream, no matters what happens. Today we will discuss about similar type of insurance plan available in market by ICICI that claims to fulfill your child’s dream no matter what are the uncertainties in your life. ICICI Pru Smart Kid Regular Premium Plan is endowment regular premium, traditional plan with two options to receive guaranteed educational benefits. Let’s check out ICICI Pru Smart Kid Regular Premium plan is really smart or not. Like traditional plan this plan provides risk cover and guaranteed and non-guaranteed benefits. It provides two options to receive those benefits. 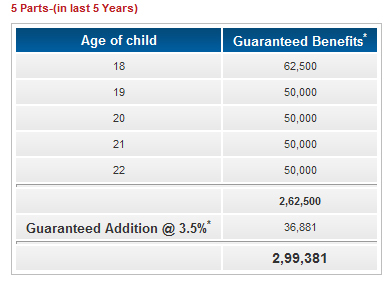 You can take this benefit in last 5 years of the policy or you can opt for benefit at intermediate milestones. Above illustration is for a 30 year old parent who has a new-born child. The tenure of the policy is 22 years. The sum assured is Rs 2,50,000 and the premium is Rs 12,717 to be paid for 22 years, so total amount paid in 22 years is Rs 2,79,774. 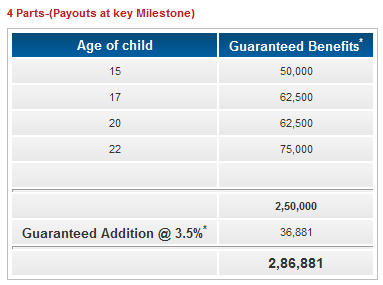 If you select option of benefit at intermediate milestone than Fixed amounts, depending on the sum assured are paid at the end of 15, 17, 20 and 22 years. A guaranteed amount equal to 3.5% of the sum assured of the first four years is paid on maturity. Additional non-guaranteed benefit either @6% or 10% will depend on the performance of the company. If you select option of benefits in last 5 year of the policy than Fixed amounts, depending on the sum assured are paid at last 5 consecutive years of policy. Similar to option 1 here also guaranteed amount equal to 3.5% of the sum assured of the first four years is paid on maturity & again additional non-guaranteed benefit either @6% or 10% will depend on the performance of the company. The policy provides for a premium waiver benefit. This means that in case of death of the parent, the future premiums of the policy will be waived. So essentially, the benefit will be paid to the child as per schedule even if the parent is no more. This is an additional benefit which can be availed along with the base plan, by paying a marginal extra cost. On the death of the parent (Life Assured) during the term of the product, 10% of the Sum Assured under the rider is paid to the nominee every year, for the remaining years, till the maturity of the policy. On the death of the parent (Life Assured) due to an accident, the child gets an additional Sum Assured. In case of accidental death of the parent while travelling by mass surface transport, the nominee will get twice the Sum Assured under the rider. (1) This policy does not gives money whenever you want. Either you can take payout for last five years or at for intermediate milestone only. If you need money at early stage it is not possible in this plan. (2) Rate of return in this plan is in between 3.5% to 6.5%. Compare to current inflation in education and other need this return may not suffice. (3) Compare to this policy other investment avenue offers better returns instead of this policy if someone invest in PPF than 8.8% interest can be earned and all money can withdraw after 15 years. (4) Non-guaranteed return shown @ 6% or 10% in this policy is approximate & based on assumption actual return may vary and depends upon ICICI. (5) Tax benefit on this product is as per current tax law which may change. Based on above one can say that this policy not seems to be smart or not giving smart returns.TV advertisement may encourage you to purchase this policy (based on premium waiver benefit) but Only premium waiver benefit is not good reason to buy any child plans. « No need to file income tax returns if ?